General Hospital (GH) spoilers tease that Jason (Steve Burton) will have a nasty run-in with Franco (Roger Howarth) this week, February 12-16. Liz (Rebecca Herbst) will do her best to keep the peace, but it won’t be easy. Jason just won’t be able to contain his rage during this encounter. He’ll take this opportunity to lash out at Franco and deliver some fierce threats. Jason would prefer to just avoid Franco, but that’s not realistic. Port Charles isn’t that big and as long as Franco’s in Jake’s (Hudson West) life, Jason will have to interact with him. Nevertheless, Jason will make it clear that he hasn’t forgotten the past. He’s prepared to hold a grudge indefinitely. 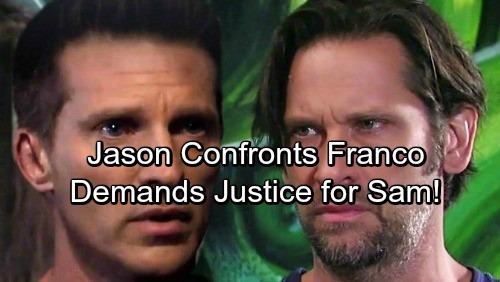 Others in PC may have given Franco a clean slate or at least dialed down their anger, but not Jason. He’ll remain determined to get justice for Sam (Kelly Monaco). General Hospital spoilers say Jason will spew some insults and make a firm promise. He’ll insist that Franco’s going to pay for his past actions. Jason intends to make sure Franco suffers for all the pain he caused. He couldn’t care less about the brain tumor excuse. It doesn’t change what Sam had to go through. As Jason’s malicious comments rev up, Liz will probably step in and suggest that’s enough. She gets why Jason can’t forgive Franco, but she’ll hope he can learn to tolerate him. Unfortunately, that may be wishful thinking on Liz’s part. GH fans know Jason always follows through on his promises. Since he’ll threaten to destroy Franco, you’d better believe he’ll put a plan in motion sooner or later. Jason can’t stand by and watch Franco get everything he’s dreamed of. He’s not content to watch Franco play the role of a doting daddy and act like he’s a perfect gentleman. General Hospital spoilers say Franco and Liz could face some major obstacles thanks to Jason. A “Friz” destruction plot could be in the works. Jason can’t be with Sam right now, but he’ll continue to fight for her in a way. 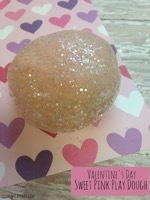 He may feel like getting revenge is at least one thing he can do for his love. It might help Jason stop feeling so powerless. It looks like Franco had better stay on guard! We’ll give you updates as other GH news comes in. Stick with the ABC soap and don’t forget to check CDL often for the latest General Hospital spoilers, updates and news.